← Is Microsoft forcing Windows 10 upgrades again? A German Consumer Association (Verbraucherzentrale) has filed a legal action against Microsoft Germany to stop automatic download of Windows 10 Upgrade files. Since July this year Microsoft has been trying to get users to upgrade to its newest Windows 10 Operating System (offering a free upgrade for the first year). I’ve adressed this issue within my blog post Is Microsoft forcing Windows 10 upgrades again?. During the last months, some users are facing an unwished download of Windows 10 install files and in some cases an upgrade to Windows 10. The problem: Not all hardware is ready for Windows 10, so an upgrade to Windows 10 fails. Also some (business users) are depending on solutions (hard- and software) not suitable on Windows 10. We have here reports in Switzerland and in Germany, that small business users are failing with Windows 10 upgrade and needed a costly service from specialists to roll back their systems to previous Windows versions. Since a few days, new reports showing that Microsoft forces Windows 10 upgrade again and offers only the options “Upgrade Now” or “Upgrade Tonight” (see screenshot above). The story has been reported at microsoft-news.com, at neowin.net. Tech-savvy users will use the X button to close the window – but Get Windows 10 will be shown later again – as comments left in my German blog suggests. For less knowledgeable users, the implications of closing the window are terrible unclear. Since summer 2015 there has been many user complaints about this Windows 10 upgrade policy file to German Consumer Association. 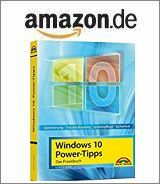 Because downloading Windows 10 update files without user consent will produce costs (especially on systems using a limited data volume), a German Assoziation has filed a legal action against Microsoft Germany, seeking an injunction to stop this upgrade policy. The (German) documents of Verbraucherzentrale Baden-Württemberg explaining the legal action case may be found here Microsoft wegen “Zwangsdownload” abgemahnt. Without consent of the users an installation package for the new operating system is downloaded and stored on the hard disk. 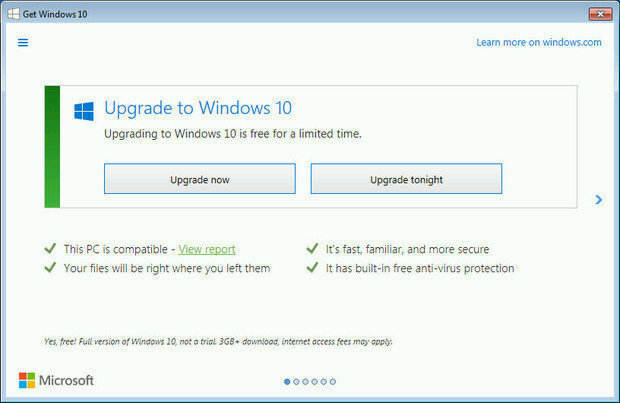 Microsoft offered to users of its operating system the “reservation” of a free upgrade to the new Windows 10th. No interest? No matter: The up to 6GB large installation package was still downloaded and stored on your hard drive – without the knowledge and consent of the users. The Verbraucherzentrale Baden-Württemberg is now taking legal action against such “forced Downloads”. For several weeks, consumers who have been using the Microsoft operating systems Windows 7 and Windows 8.1 complains, an up to 6 GB large data packet, which had been loaded onto their computer in the background in a hidden system folder – without that they had been informed about this or have issued an approval. The package includes installation files for the new Microsoft operating system Windows 10. The user will be asked but only after the download, whether they agree with an installation or not. For the Consumer Association this approach represents an unacceptable harassment, since users themselves must actively seek to eliminate the forced upon installation files after downloading. The problem of a “forced download” is, for example, when little space is available. In SSD hard drives environments for example, the package may be more than 10 percent of the total available disk space make … Even with Internet connections that allow only a certain volume of data a month, such a “forced download” cause problems. That approach is a thorn in the side many users – many Consumer complaints and also comments may be found in Internet forums. The Consumer Association (Verbraucherzentrale) of German state of Baden-Württemberg has warned Microsoft. But Microsoft has, however, so far refused to issue a penalty clause explanation. The Consumer Association (Verbraucherzentrale Baden-Württemberg) will now undergo the procedure of Microsoft to judicial review. This entry was posted in Update, Windows and tagged injunction, legal action, Microsoft, Upgrade, Windows 10. Bookmark the permalink. So what can we do about the scandalous delivery of a non tested bug infested software that is crippling our computers more and more every day. Can we regress back to windows 8? Will Microsoft support this? What legal action can we take in Canada and USA? I was using my laptop daily but now have been using my iPad because of too many problems such as: 1) Action centre not working. 2) Start button “Critical error” when used. 3) Edge browser and Cortina no longer work. 4) Had to start using Outlook browser again because Edge no longer works, but when I try to open certain files Outlook no longer opens Hyperlinks. And something new happens on a daily basis. Thanks Microsoft for SCREWING up my i7 computer that was working great prior to Windows 10. I don’t know the possibilities for legal actions in US & Canada. Here in my working environment I still using Windows 7 Ultimate for my machine. I’ve written a couple of (unfortunately German) blog-posts how to stop Windows 10 Upgrade. This remembers me to prepare an English blog post about preventing W10 upgrade. Just in brief – as mentioned in my German blog post Windows 10 Upgrade mit GWX Control Panel blocken, you can use the free tool GWX Control Panel to keep your Windows 7 SP1/Windows 8.1. Downgrading a Windows 10 OEM machine will be a lot more complicated, especially Microsoft has annonced that support for new Intel processor platforms will be focussed on Windows 10 after 2017.